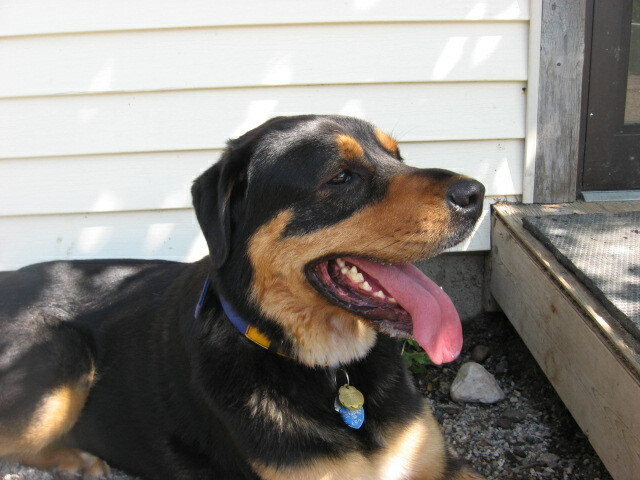 I adopted Sofi from a shelter (pictured above) in the summer of 2008. I found that she was very frightened of adults, children, and any kind of noise. Every day was a challenge to help this dog to adapt to my home, my other dogs and me. I enrolled her in a basic obedience class, hoping that she would become more confident and less afraid. Although we were interacting with other dogs and their owners, this did nothing to help with her fears. When Karla’s opened, I started taking Sofi to Day Care – at first she went for half a day, and now we have increased Day Care to 2 full days a week. Sofi is a very different girl. She is so much happier, now that she has her many doggy friends and a staff of very caring people to work with her. Sofi has become very confident and her personality has really developed. She gets very excited when I tell her it is time to go to Karla’s and see her buddies! I am very grateful and happy that there is such a wonderful facility in Mount Washington Valley! 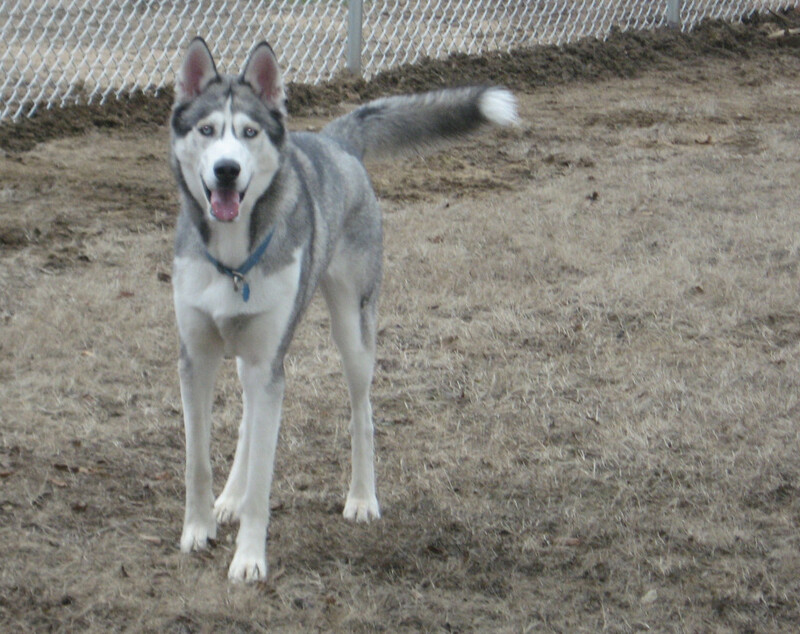 Karla’s is great place for Tai (pictured above), he is high-spirited with a LOT of energy. He gets very excited when he knows hes going to see his buddies. 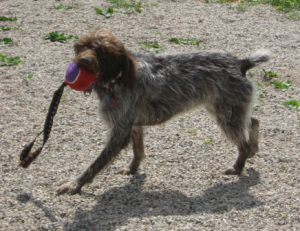 He happily greets the staff and can’t wait to go out to the yard where he gets to run (he LOVES to run), plays catch, and always has a friend. He goes to Doggie Day Care a few times a week and he burns off all of his energy and very relaxed when he gets home. Tai isn’t a fan of baths, but with his trust of Staff, he’s squeaky clean and smells fresh after his baths. The staff are very friendly and very knowledgable. 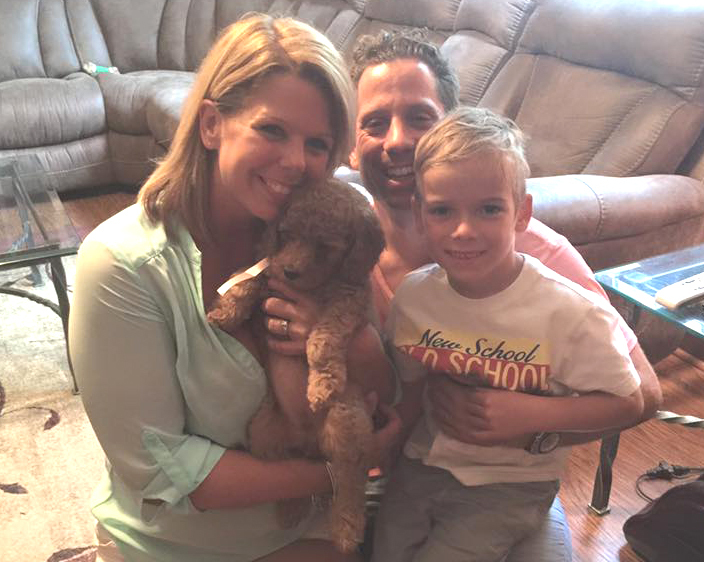 Overall, Tai loves Karla’s and so do we, it’s always pleasant, we also know he’s in great hands, and has a BALL! This is the most wonderful, caring, loving, warm and safe place to leave your pet. 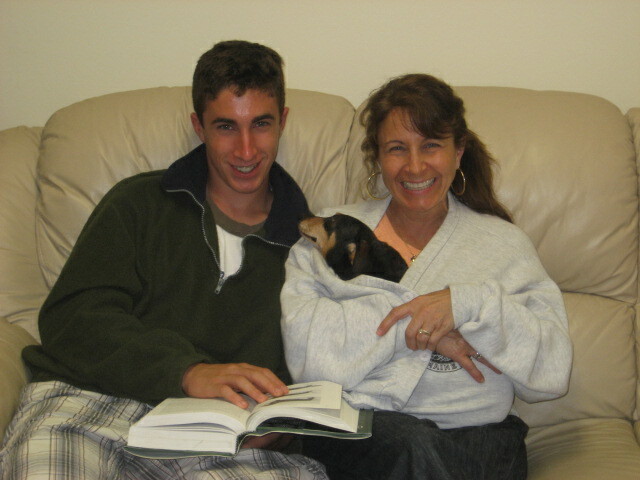 I left my 15 year old dachshund Katie, who has never been away from us, let alone stayed in a kennel in all her 15 years. She is old and ailing and needed plenty of special care and she received everything plus more at Karla’s Pet Rendezvous. I was concerned about her becoming anxious and stressed and instead she THRIVED. 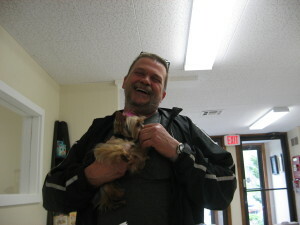 Karla and her staff are all exceptional, wonderful animal-loving people! Their love and passion for animals is all so evident. The place is clean, cozy, bright and cheery! I am so grateful for all the love and care they gave my Katie. 10 stars to Karla’s place! Also, for an added treat for your pet while your pet is staying at karla’s, get a Reiki Treatment by Karen McCarthy from Fryeburg, ME! Katie had one and it made a world of difference. 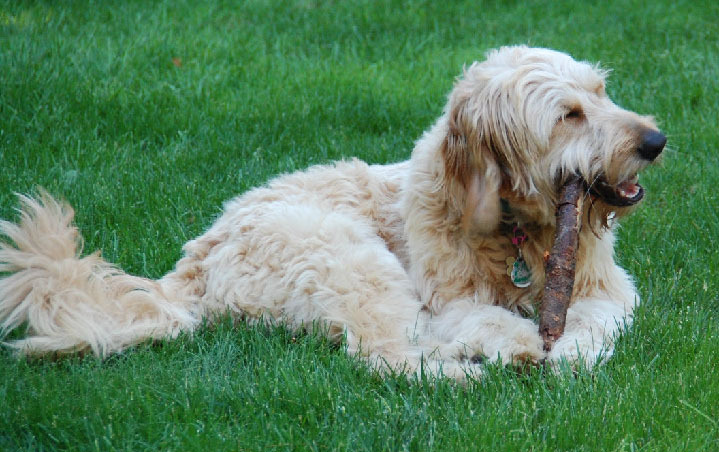 Maple (pictured above) has been an integral part of our family from day one. Even when I was a patient in a nursing facility and our son was in a hospital, we would not consider returning him, as he was so very much a family member. And now that I am getting better, all thoughts of our returning him have flown out the window. He learns very quickly and is a good doggy. We have been taking him to weekly classes since very shortly after we brought him home. Our trainer is wonderful. I cannot say enough good things about Karla as a breeder. She is everything one looks for in a responsible breeder. She and Wendy her trainer did an excellent job in matching us and this wonderful dog to us. 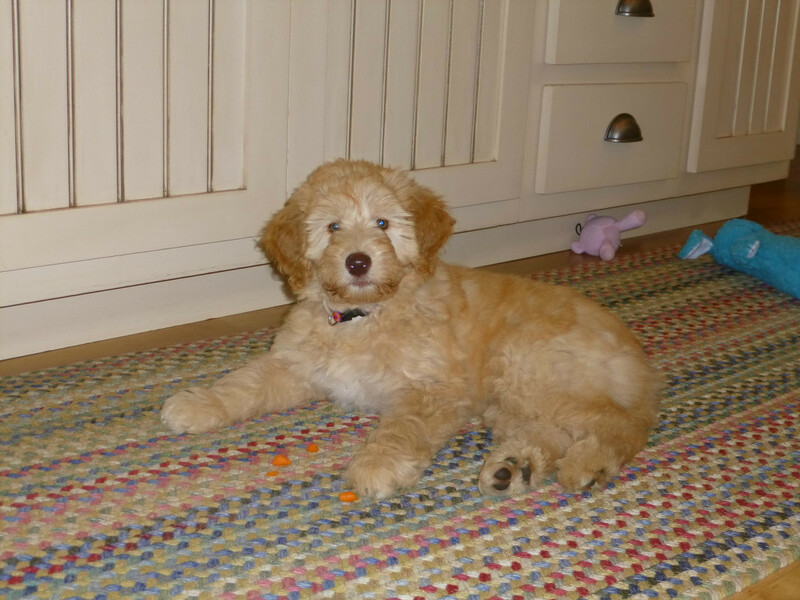 We have a Labradoodle named Dorrie (pictured above) who we obtained from Karla from Angel’s litter. 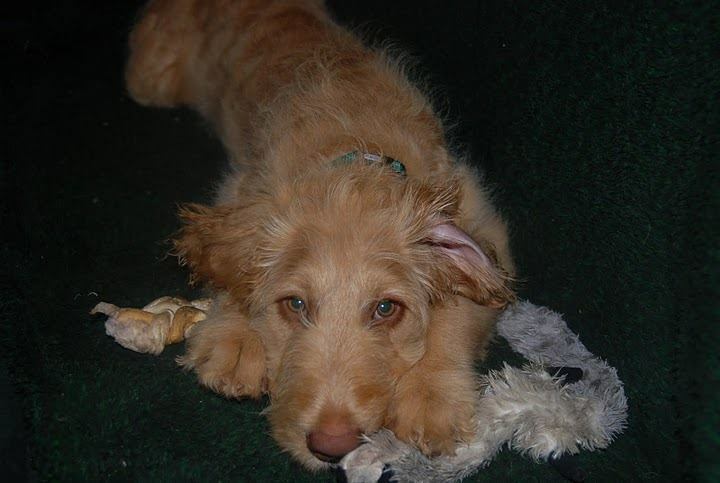 She was 8 weeks old when she came to us and is now 13 weeks old at the time this is written. 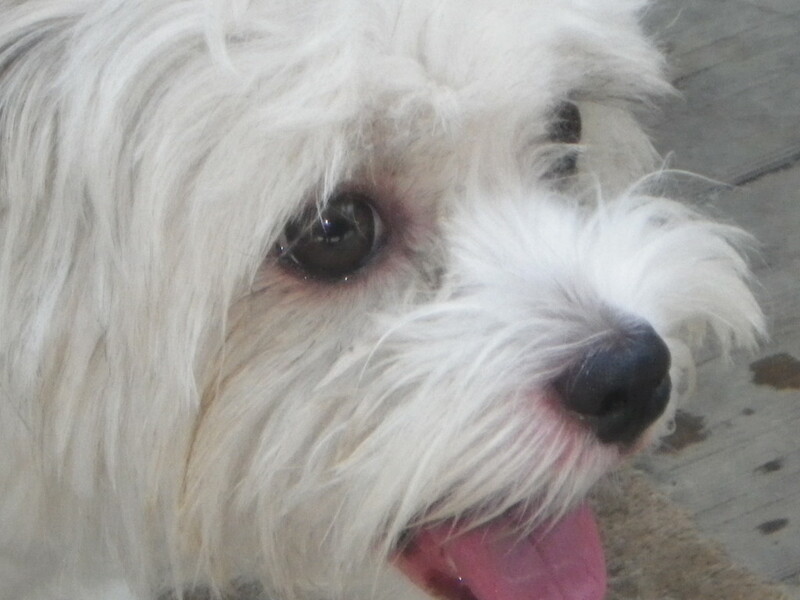 Dorrie is a fantastic puppy and has added a lot of joy into our lives. 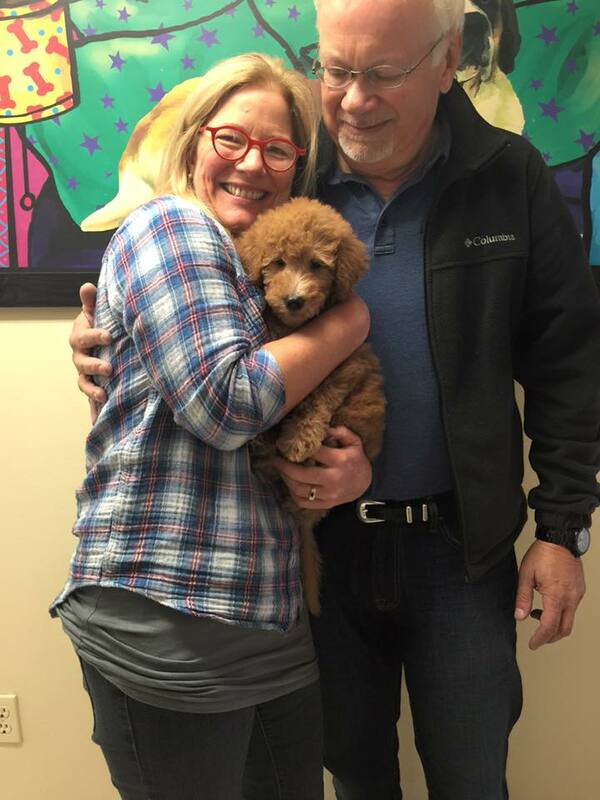 We can’t say enough positive things about Karla and her staff and their genuine desire to get us matched with the right puppy. And after we picked up Dorrie, they have also been extremely helpful in Dorrie’s transition period into our home, providing a wealth of information on training and nutritional issues. We had searched and researched a long time to find the right breed and right breeder for our new puppy and don’t know how we could have made a better choice. Just a quick note and a photo. 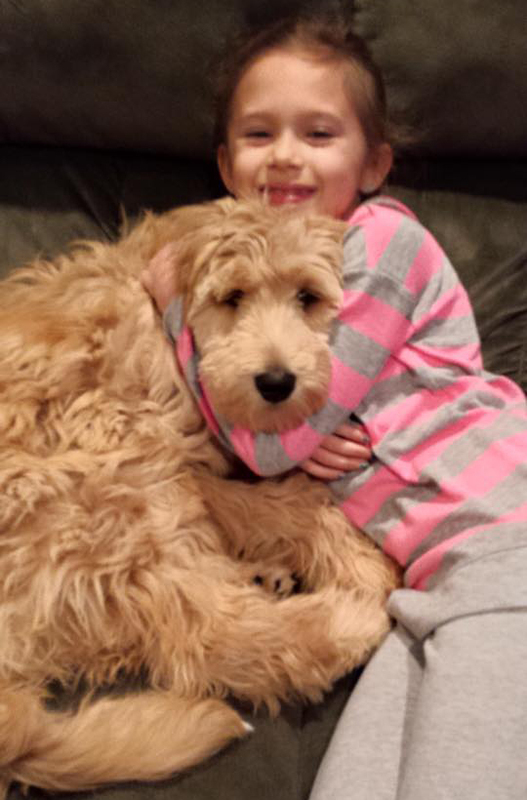 Bella (pictured above) is such a special part of our family. It is hard to believe we ever lived without her. 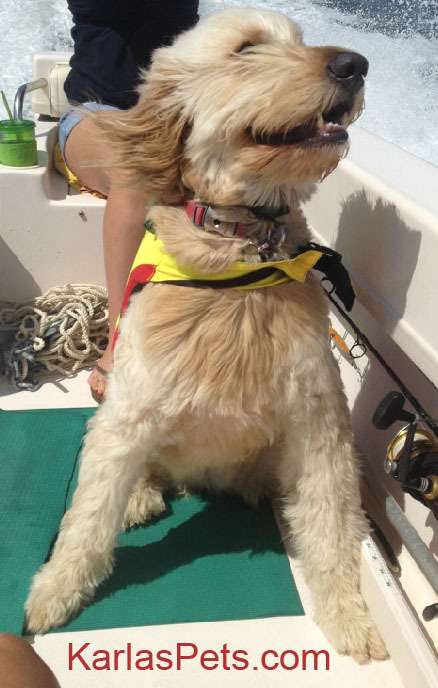 Loyal, loving, fun and good tempered – we constantly refer to her as “the greatest dog ever”. 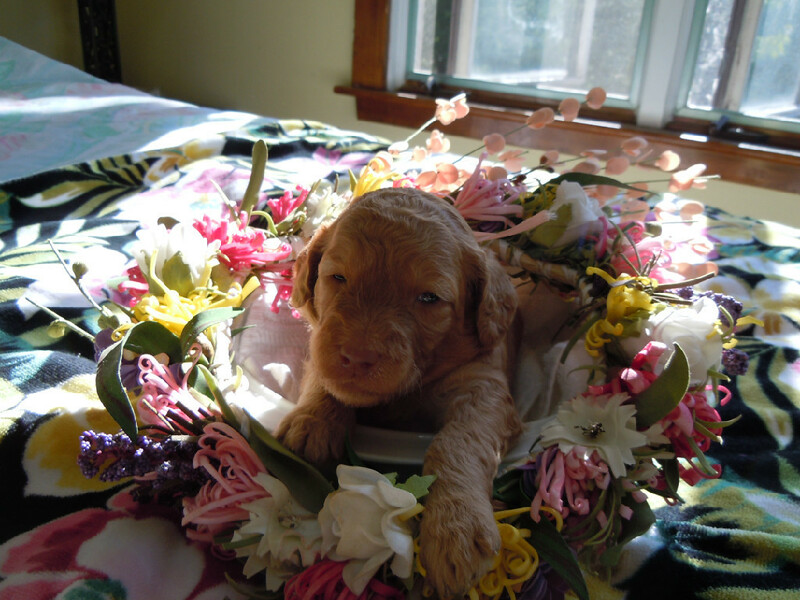 Wanted to thank you again (her litter was born 3-29-2010) and let you know (and see) that she has a pretty good run of things here in Duxbury, Massachusetts. Because of Hobbs’ ordeal, we are very discerning when it comes to his care. 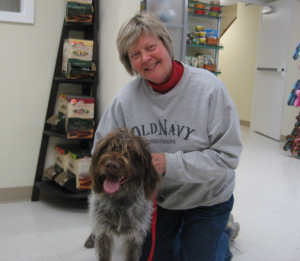 Karla and her staff offer the very best.Hobbs is considered by every veterinarian who knows his case as a miracle dog. Mass Veterinary Referral Hospital named him Emergency room Patient of the Month-complete with poster-for surviving the worst case of Pyrothax they had encountered. Survival was not optimistic, but drastic measures were taken because he was only 1 1/2 years old. Eight days in ICU, his chest was completely cut open for surgeries and subsequent plasma transfusions, with drainage tubes, antibiotic IV’s oxygen, catheter and whatnot inserted inserted everywhere in his body. Hope wasn’t given for our big guy for six days. Hobbs loves to go to and gets all excited when we say, “want to go to Karla’s?” We love it because he had become a alittle spoiled and that doesn’t work for a 110 lb dog. Through her professional care he has become more socialized, more relaxed and better mannered. I can drive without worrying about him jumping out of the window at every living thing we pass. He is a punch card-playcare “Rendezvous Regular”. We have boarded him several times, and he always looks so handsome when he is groomed there. 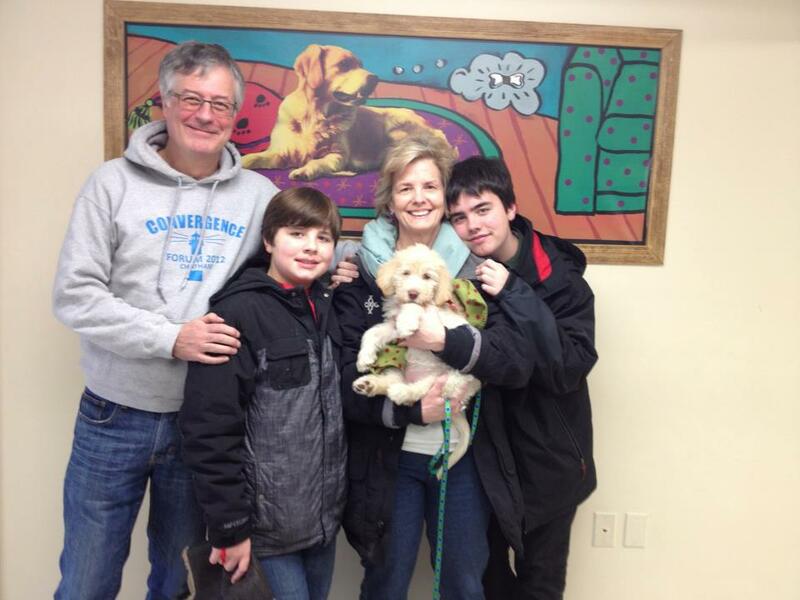 We recommend Karla and the Staff at Karla’s Pet Rendezvous to everyone. We have been more than pleased with every service Hobb’s has received and with every staff member he has been inviolved with. We are incredibly pleased with our puppy, Hollie (pictured above), who was born in November, and came home with us in January. The entire process from beginning to now has been fantastic. Obviously, the process isn’t the only important part, but Karla made it easy, informative and we always felt supported. The real compliment comes from the results. Hollie is the sweetest puppy I have ever met. She is really intelligent, thinks of herself as my baby, and the kids as her siblings. We have so, so enjoyed her as a part of our lives, and I am so happy that she is now part of it. 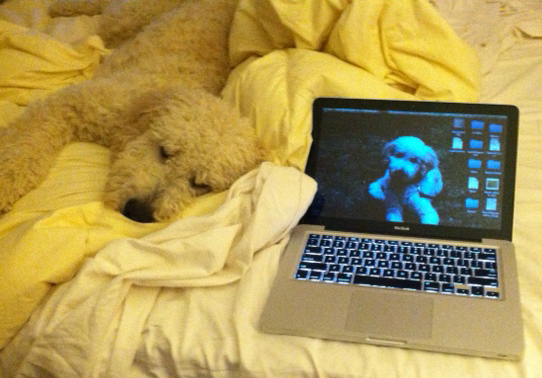 Bogie (pictured above) had a blast at your place this weekend. We are so blessed to have found you! Your co-workers are well trained and a pleasure to interact with. I feel so welcomed when I bring Bogie in. And I know Bogie is well cared for. He loves coming in too! somewhat apprehensive about bringing them in for a cut. a week- I could not pick him up, touch him, etc. deal to me. Thank you so very much. I can’t tell you how happy I am with the grooming of Shamus and Clover (not pictured). Of course they looked like a million. Fur so fluffy, soft and shiney. But the detail to their very long nails. No one has ever done such a nice job with length. Just perfect. (the only other time they looked that good on Shamus was when he was under anesthesia) I know he is a nervous guy and it couldn”t have been easy! And their ears! Very nice. As expected they were glad to be back in their car and leaving but they made sure to let me know they actually had a good time. Everyone was very happy and exhausted. The ride home to Tuftonboro was easy! I think the dynamics of seeing other happy pups has made Karla’s an okay place to be for them. I think as far as Shamus sensitivities to shampoos, I am not expecting any issues. More Testimonials for Karla’s Pet Rendezvous ! in 11 years my dog has been taken care of someone else than us. stsr palace for our pets! 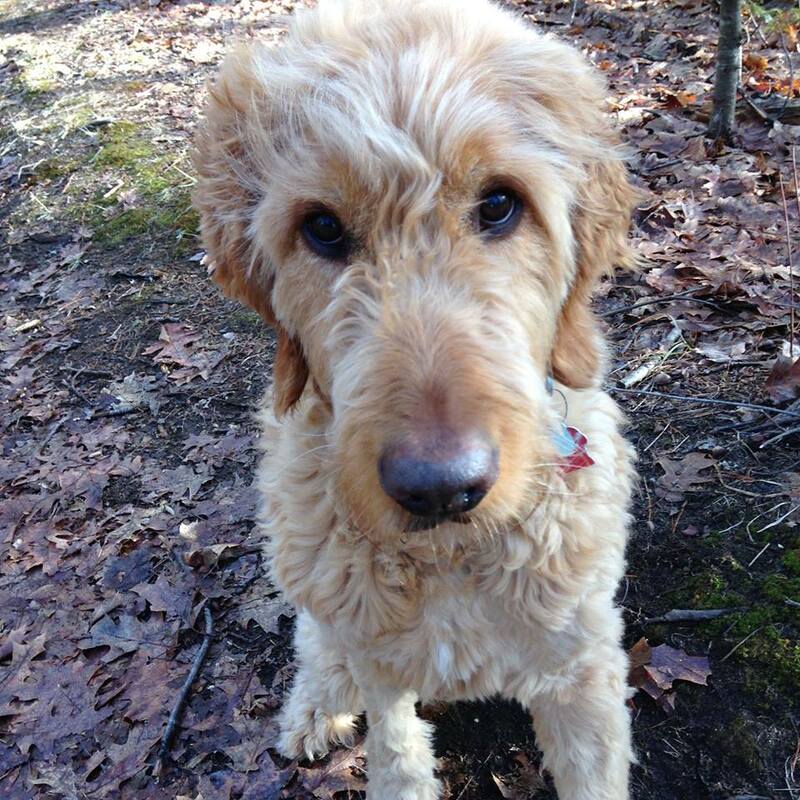 “We highly recommend Karla if you are looking for Doodle babies! were great. I was very impressed and will be back soon! was pleasant and very welcoming as soon a we walked in the door. most of the hotels in N. Conway, and it is very easy to get to. from Storyland, so not exactly close, but could be on your way. HIGH expectations. We drove from Boston with our 1 year old Boston Terrier to spend a weekend in N. Conway. We have never left her in a kennel overnight so, this was a first for all of us. we had signed up for were explained to us and verified. pets. Grooming and self-serve dog wash are great, too. evident at Karla’s by all. This place is a 10 STAR place. her at all times and gave her everything she needed and more. If Jake could speak I am sure he would say “Karla’s is a great home away from home!” Jake has just spent ten days there and he came home looking wonderful – clean, well groomed and very relaxed. We have taken him there several times in the past year and he is always excited upon his arrival. That is Jake’s own testimony. We see Karla’s as very clean, well organized, well staffed and a pleasant place for all. The health watch is thorough. Pets are checked for fleas upon arrival and required to be up to date with all vaccinations. The play and exercise areas are spacious and always well cared for – after Jake digs a few holes they are quickly filled up too. We are fortunate to have such a fine facility in the Mt. Washington Valley. 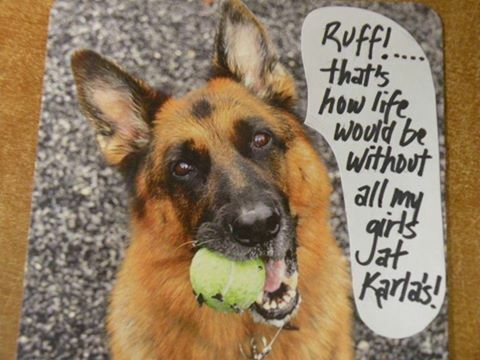 Have a vacation and be at peace with your pet at Karla’s!